A support level is a price at which penny stock shares see increasing demand, which in turn holds the stock above that level. For example, a penny stock may keep falling toward one dollar, but the shares bounce back to higher prices each time the price gets close to one dollar due to increased trading volume. While support can form at any price for any stock, with penny stocks it’s much more common for supports to form at round number prices. Investors generally buy or sell at threshold levels, such as $4.00 or $1.50, as opposed to $4.12 or $1.44. Because many investors buy at these round number prices, and penny stocks have low trading activity, support levels often form. The beauty of a solid support level is that it theoretically limits your downside. Buying shares at $1.02, when a strong support level exists at $1.00, can be a good strategy. 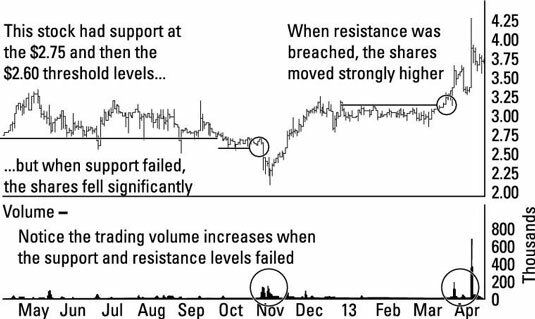 Increasing trading volume at support: A true support level is based on increasing demand at certain prices. If you see an increase in trading volume when shares fall to the support level, then that TA pattern is more likely reliable. Multiple attempts at break down: The more times that support gets tested without failing, the more reliable the support level will be. You can’t assume support exists at any certain price if the shares haven’t tested that level. However, if the stock fell toward support twice, or three times, or eight times, and the support level held up, you have a more trustworthy support level pattern. Like any technical analysis (TA) pattern, support levels are prone to break down or fail. This can be costly to investors who trust the pattern because they aren’t expecting that downside. When support fails, the shares sometimes fall significantly lower. A company may have held up above a $3.00 support for a long time, but when events induce enough selling that the shares break below $3.00, they very often will continue down toward $2.50, $2.00, or even lower. If you’re relying on a TA support level pattern you’ve found, as soon as it breaks down, you need to reconsider the stock. After a support level gets broken, it no longer applies. Support can re-form, but there are no guarantees that it will, and it may take a long time before a trustworthy pattern surfaces again. When support levels get broken, they often “flip” and become resistance levels at the same price. In other words, shares have difficulty trading above a specific price. For example, a $2.25 support level gets breached as shares fall toward $1.70. The $2.25 level may then become resistance, and the shares that were once held up by the support level will have difficulty trading above the $2.25 range. Sometimes the penny stock company buys back its own shares on the open market. This buying pressure is often significant enough to create a support level in the stock. When a company buys back its own shares, it makes this information publicly known, and you can bring that into your support level consideration.